Pharmacy is the science and technique of preparing, dispensing, and review of drugs and providing additional clinical services. It is a health profession that links health sciences with pharmaceutical sciences and aims to ensure the safe, effective, and affordable use of drugs. The professional practice is becoming more clinically oriented as most of the drugs are now manufactured by pharmaceutical industries. Based on the setting, the pharmacy is classified as a community or institutional pharmacy. Providing direct patient care in the community of institutional pharmacies are considered clinical pharmacy. Pharmacology is sometimes considered as the 4th discipline of pharmacy. Although pharmacology is essential to the study of pharmacy, it is not specific to pharmacy. Both disciplines are distinct. Those who wish to practice both pharmacy (patient oriented) and pharmacology (a biomedical science requiring the scientific method) receive separate training and degrees unique to either discipline. Pharmacy technicians support the work of pharmacists and other health professionals by performing a variety of pharmacy related functions, including dispensing prescription drugs and other medical devices to patients and instructing on their use. They may also perform administrative duties in pharmaceutical practice, such as reviewing prescription requests with medic's offices and insurance companies to ensure correct medications are provided and payment is received. A Pharmacy Technician in the UK has recently been referred to by some as a professional. Legislation requires the supervision of certain pharmacy technician's activities by a pharmacist. The majority of pharmacy technicians work in community pharmacies. In hospital pharmacies, pharmacy technicians may be managed by other senior pharmacy technicians. In the UK the role of a PhT in hospital pharmacy has grown and responsibility has been passed on to them to manage the pharmacy department and specialised areas in pharmacy practice allowing pharmacists the time to specialise in their expert field as medication consultants spending more time working with patients and in research. Pharmacy technicians are registered with the General Pharmaceutical Council (GPhC). The GPhC is the regulator of pharmacists, pharmacy technicians and pharmacy premises. There are different requirements of schooling based on the area of pharmaceuticals a student is seeking. In the United States, the general pharmacist will attain a Doctor of Pharmacy Degree (Pharm.D.). The Pharm.D. can be completed in a minimum of six years, which includes two years of pre-pharmacy classes, and four years of professional studies. After graduating pharmacy school, it is highly suggested that the student go on to complete a one or two year residency, which provides valuable experience for the student before going out independently to be a generalized or specialized pharmacist. The curriculum created for a Pharm.D. is made up of 208-credit hours. Of the 208-credit hours, 68 are transferred-credit hours, and the remaining 140-credit hours are completed in the professional school. There are a series of required standardized tests that students have to pass throughout the process of pharmacy school. The standardized test to get into pharmacy school is called the Pharmacy College Admission Test (PCAT). In a student's third professional year in pharmacy school, it is required to pass the Pharmacy Curriculum Outcomes Assessment (PCOA). Once the Pharm.D. is attained after the fourth year professional school, the student is then eligible to take the North American Pharmacist Licensure Exam (NAPLEX) and the Multistate Pharmacy Jurisprudence Exam (MPJE) to work as a professional pharmacist. In Ancient Greece, Diocles of Carystus (4th century BC) was one of several men studying the medicinal properties of plants. He wrote several treatises on the topic. The Greek physician Pedanius Dioscorides is famous for writing a five volume book in his native Greek Περί ύλης ιατρικής in the 1st century AD. 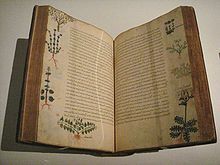 The Latin translation De Materia Medica (Concerning medical substances) was used a basis for many medieval texts, and was built upon by many middle eastern scientists during the Islamic Golden Age. Pharmacy in China dates at least to the earliest known Chinese manual, the Shennong Bencao Jing (The Divine Farmer's Herb-Root Classic), dating back to the 1st century AD. It was compiled during the Han dynasty and was attributed to the mythical Shennong. Earlier literature included lists of prescriptions for specific ailments, exemplified by a manuscript "Recipes for 52 Ailments", found in the Mawangdui, sealed in 168 BC. 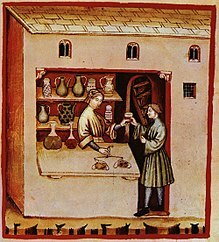 In Europe pharmacy-like shops began to appear during the 12th century. In 1240 emperor Frederic II issued a decree by which the physician's and the apothecary's professions were separated. "The first pharmacy in Europe (still working) was opened in 1241 in Trier, Germany." Pharmacists practice in a variety of areas including community pharmacies, hospitals, clinics, extended care facilities, psychiatric hospitals, and regulatory agencies. Pharmacists themselves may have expertise in a medical specialty. Another form of compounding is by mixing different strengths (g, mg, mcg) of capsules or tablets to yield the desired amount of medication indicated by the physician, physician assistant, Nurse Practitioner, or clinical pharmacist practitioner. This form of compounding is found at community or hospital pharmacies or in-home administration therapy. While most Internet pharmacies sell prescription drugs and require a valid prescription, some Internet pharmacies sell prescription drugs without requiring a prescription. Many customers order drugs from such pharmacies to avoid the "inconvenience" of visiting a doctor or to obtain medications which their doctors were unwilling to prescribe. However, this practice has been criticized as potentially dangerous, especially by those who feel that only doctors can reliably assess contraindications, risk/benefit ratios, and an individual's overall suitability for use of medication. There also have been reports of such pharmacies dispensing substandard products. Canada is home to dozens of licensed Internet pharmacies, many of which sell their lower-cost prescription drugs to U.S. consumers, who pay one of the world's highest drug prices. In recent years, many consumers in the US and in other countries with high drug costs, have turned to licensed Internet pharmacies in India, Israel, and the UK, which often have even lower prices than in Canada. In the United States, there has been a push to legalize the importation of medications from Canada and other countries, in order to reduce consumer costs. While in most cases importation of prescription medications violates Food and Drug Administration (FDA) regulations and federal laws, enforcement is generally targeted at international drug suppliers, rather than consumers. There is no known case of any U.S. citizens buying Canadian drugs for personal use with a prescription, who has ever been charged by authorities. The pharmaceutical sciences are a group of interdisciplinary areas of study concerned with the design, action, delivery, and disposition of drugs. They apply knowledge from chemistry (inorganic, physical, biochemical and analytical), biology (anatomy, physiology, biochemistry, cell biology, and molecular biology), epidemiology, statistics, chemometrics, mathematics, physics, and chemical engineering. Pharmacology: the study of the biochemical and physiological effects of drugs on human beings. Pharmacokinetics: the study of the factors that control the concentration of drug at various sites in the body. Simply "What the body does to the drug"
Pharmaceutical toxicology: the study of the harmful or toxic effects of drugs. Pharmacogenomics: the study of the inheritance of characteristic patterns of interaction between drugs and organisms . Pharmaceutical chemistry: the study of drug design to optimize pharmacokinetics and pharmacodynamics, and synthesis of new drug molecules (Medicinal Chemistry). Pharmaceutics: the study and design of drug formulation for optimum delivery, stability, pharmacokinetics, and patient acceptance. Pharmacognosy: the study of medicines derived from natural sources . As new discoveries advance and extend the pharmaceutical sciences, subspecialties continue to be added to this list. Importantly, as knowledge advances, boundaries between these specialty areas of pharmaceutical sciences are beginning to blur. Many fundamental concepts are common to all pharmaceutical sciences. These shared fundamental concepts further the understanding of their applicability to all aspects of pharmaceutical research and drug therapy. 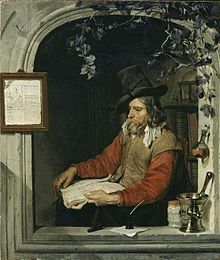 The word pharmacy is derived from Old French farmacie "substance, such as a food or in the form of a medicine which has a laxative effect" from Medieval Latin pharmacia from Greek pharmakeia (Greek: φαρμακεία) "a medicine", which itself derives from pharmakon (φάρμακον), meaning "drug, poison, spell"[n 1] (which is etymologically related to pharmakos). Separation of prescribing and dispensing, also called dispensing separation, is a practice in medicine and pharmacy in which the physician who provides a medical prescription is independent from the pharmacist who provides the prescription drug. In the Western world there are centuries of tradition for separating pharmacists from physicians. In Asian countries it is traditional for physicians to also provide drugs. In contemporary time researchers and health policy analysts have more deeply considered these traditions and their effects. Advocates for separation and advocates for combining make similar claims for each of their conflicting perspectives, saying that separating or combining reduces conflict of interest in the healthcare industry, unnecessary health care, and lowers costs, while the opposite causes those things. Research in various places reports mixed outcomes in different circumstances. This shift has already commenced in some countries; for instance, pharmacists in Australia receive remuneration from the Australian Government for conducting comprehensive Home Medicines Reviews. In Canada, pharmacists in certain provinces have limited prescribing rights (as in Alberta and British Columbia) or are remunerated by their provincial government for expanded services such as medications reviews (Medschecks in Ontario). In the United Kingdom, pharmacists who undertake additional training are obtaining prescribing rights and this is because of pharmacy education. They are also being paid for by the government for medicine use reviews. In Scotland the pharmacist can write prescriptions for Scottish registered patients of their regular medications, for the majority of drugs, except for controlled drugs, when the patient is unable to see their doctor, as could happen if they are away from home or the doctor is unavailable. In the United States, pharmaceutical care or clinical pharmacy has had an evolving influence on the practice of pharmacy. Moreover, the Doctor of Pharmacy (Pharm. D.) degree is now required before entering practice and some pharmacists now complete one or two years of residency or fellowship training following graduation. In addition, consultant pharmacists, who traditionally operated primarily in nursing homes are now expanding into direct consultation with patients, under the banner of "senior care pharmacy". The two symbols most commonly associated with pharmacy in English-speaking countries are the mortar and pestle and the ℞ (recipere) character, which is often written as "Rx" in typed text. The show globe was also used until the early 20th century. Pharmacy organizations often use other symbols, such as the Bowl of Hygieia which is often used in the Netherlands, conical measures, and caduceuses in their logos. Other symbols are common in different countries: the green Greek cross in France, Argentina, the United Kingdom, Belgium, Ireland, Italy, Spain, and India, the increasingly rare Gaper in the Netherlands, and a red stylized letter A in Germany and Austria (from Apotheke, the German word for pharmacy, from the same Greek root as the English word "apothecary"). ^ Its earliest attested form in Greek could be the Mycenaean 𐀞𐀔𐀒, pa-ma-ko, written in the Linear B syllabic script and found on the PY Un 1314 tablet; this tablet is also found listed as PY Vn 1314 or PY Sb 1314. ^ Thomas D (November 2018). Clinical Pharmacy Education, Practice and Research. ISBN 9780128142769. ^ World Health Organization. World Health Statistics 2011 - Table 6: Health workforce, infrastructure and essential medicines. Geneva, 2011. Accessed 21 July 2011. ^ "Pharmacy Student handbook 2017-2018" (PDF). KU Pharmacy. August 2017. Retrieved 6 April 2018. ^ John K. Borchardt (2002). "The Beginnings of Drug Therapy: Ancient Mesopotamian Medicine". Drug News & Perspectives. 15 (3): 187–192. doi:10.1358/dnp.2002.15.3.840015. ISSN 0214-0934. PMID 12677263. ^ a b Hadzovic, S (1997). "Pharmacy and the great contribution of Arab-Islamic science to its development". Medicinski Arhiv (in Croatian). 51 (1–2): 47–50. ISSN 0025-8083. OCLC 32564530. PMID 9324574. ^ al-Ghazal, Sharif Kaf (October 2003). "The valuable contributions of Al-Razi (Rhazes) in the history of pharmacy during the Middle Ages" (PDF). Journal of the International Society for the History of Islamic Medicine. 2 (4): 9–11. ISSN 1303-667X. OCLC 54045642. ^ "The History of Pharmacy. Eminent Scientists". ^ Sharif Kaf al-Ghazal, Journal of the International Society for the History of Islamic Medicine, 2004 (3), pp. 3-9 . ^ American College of Clinical Pharmacy. The definition of clinical pharmacy. Pharmacotherapy 2008;28(6):816-817. ^ Burke JM, Miller WA, Spencer AP, et al. (2008). "Clinical pharmacist competencies" (PDF). Pharmacotherapy. 28 (6): 806–815. doi:10.1592/phco.28.6.806. ^ Knapp, KK; Okamoto, MP; Black, BL (2005). "ASHP survey of ambulatory care pharmacy practice in health systems--2004". American Journal of Health-System Pharmacy. 62 (3): 274–84. PMID 15719585. ^ Strand LM (1990). "Pharmaceutical care and patient outcomes: notes on what it is we manage". Top Hosp Pharm Manage. 10 (2): 77–84. PMID 10128568. ^ Hepler CD, Strand LM (1990). "Opportunities and responsibilities in pharmaceutical care". Am J Hosp Pharm. 47 (3): 533–43. PMID 2316538. ^ NBCH Action Brief: Specialty Pharmacy. Specialty Pharmacy December, 2013. Accessed 27 October 2014. ^ Wild, D. Specialty Pharmacy Continuum Carving a Specialty Niche Within the ACO Model." Volume 1 (Summer Issue). August, 2012. ^ Shane, RR (15 August 2012). "Translating health care imperatives and evidence into practice: the "Institute of Pharmacy" report". American Journal of Health-System Pharmacy. 69 (16): 1373–83. doi:10.2146/ajhp120292. PMID 22855102. ^ "Health Care Cost Drivers: Spotlight on Specialty Drugs" (PDF). September 2014. Retrieved 27 October 2014. ^ American Association of Pharmaceutical Scientists. "Introduction to Pharmaceutical Science". Retrieved 30 May 2016. ^ φάρμακον. Liddell, Henry George; Scott, Robert; A Greek–English Lexicon at the Perseus Project. ^ "PY 1314 Vn + frr. (Cii)". DĀMOS: Database of Mycenaean at Oslo. University of Oslo. Raymoure, K.A. "pe-re". Minoan Linear A & Mycenaean Linear B. Deaditerranean. "The Linear B word pa-ma-ko". Palaeolexicon. Word study tool of ancient languages. ^ Brennan, Troyen A.; Dollear, Timothy J.; Hu, Min; Matlin, Olga S.; Shrank, William H.; Choudhry, Niteesh K.; Grambley, William (2012-01-01). "An integrated pharmacy-based program improved medication prescription and adherence rates in diabetes patients". Health Affairs (Project Hope). 31 (1): 120–129. doi:10.1377/hlthaff.2011.0931. ISSN 1544-5208. PMID 22232102. Watkins, Elizabeth Siegel (2009). "From History of Pharmacy to Pharmaceutical History". Pharmacy in History. 51 (1): 3–13. - A landmark study in hospital pharmacy performance based on an extensive literature review and the collective experience of the Health Systems Pharmacy Executive Alliance.